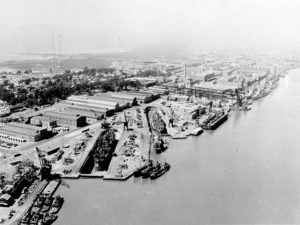 The stories told about blast furnace slag by promoters of a proposed south Vallejo waterfront slag cement plant serve to illustrate both the quality of the information presented to the public, and the folly in thinking the environmental review process provides adequate protection. The applicants have attempted to create the false impression that there are two very different kinds of blast furnace slag — iron and steel — and that Orcem’s iron slag is the “safe” kind. There has never been any real confusion surrounding these fake facts, other than what the applicants have tried to stir up. The slag is named according to the furnace in which it’s created, and you have to refine iron ore in a blast furnace in order to make steel. Steel furnace slag would be called BOF or EAF slag, and is little different from Orcem’s blast furnace slag in composition — except that it’s likely cleaner, since the steel furnaces use refined iron from a blast furnace along with 10-20 percent steel scrap. The hazardous impurities in the waste slag come primarily from the feedstock ore, regardless of the type of furnace, and iron blast furnace slag is the result of directly processing those ores. More than two years ago the applicants assured our school board that: “Absolutely none of Orcem’s materials or products are toxic. None. Each metal’s slag has a unique chemistry. Orcem uses blast furnace slag from the production of iron, which is not toxic.” Meanwhile, the Environmental Impact Report for the project revealed that more than 16 tons of fugitive dust in the dangerously small particle size of 10 microns or less would be released into south Vallejo’s air each year as the slag material is moved around and stored in massive open piles. So how well do those corporate claims hold up under scrutiny — that tons of slag dust would not harm our school kids a quarter mile downwind? Not even a little bit. The pattern of intentional misinformation surrounding this project stretches back to the early stages of the application process. In January of 2014 the regional air quality board asked for more information with regard to the application for a permit. One of the requested items: “Provide MSDS of the raw materials including the composition with any toxic contents.” The corporate office in Ireland responded with a single Material Safety Data Sheet for blast furnace slag from the marketing division that sells slag for Nippon Steel in Japan — one which lacks nearly all of the toxicology warnings of safety sheets from our domestic slag producers. So what accounts for the stark differences in hazard assessment? While the global MSDS formats have been brought into closer agreement, the U.S. standards require much better and more complete content information in order to protect workers and the public. But even here the hazard information in any one safety sheet is almost certain to be fragmentary. The U.S. Chemical Safety and Hazard Investigation Board looked at 140 safety data sheets for substances that produce combustible dusts, and found none that contained all the information the board said was needed to work with the material safely. A second study examined 62 safety data sheets for common flammable liquids and again found every single data sheet to be inadequate in hazard assessment. What’s at stake here is the health and quality of life for some of our most vulnerable residents — our children, the sick, and the elderly. This is no time to play fast and loose with the truth by shopping around for the least informative version of hazard data available worldwide. This proposal emerged in a haze of questionable transactions surrounding the foreclosure sale of the property, and the revival and transfer of a lapsed lease with the City for public trust land. It was hyped as a port project and major source of economic stimulus — when in reality port use at the site is not permissible under the Bay Plan, and the cargo category it claimed it would service disappeared from regional statistics as something even worthy of tracking. The applicants have informed the Bay Commission staff that the cement plant would account for much less than half of the project capacity, and that more industrial tenants would be needed down the road. There has been no environmental review of the activities of these future industrial tenants or even any indication given to the public that more heavy industry would follow with approval of this project. If this was really such a wonderful opportunity for Vallejo, there would be no need to hide critically important information and repeatedly mislead the public and our elected officials. VMT project is 75% undefined! I talked with several people holding this view and it occurred to me that this request may be coming from missing a few pieces of key information. I will do a quick summary first and then explain the details. The project as VMT/Orcem presented today (March 6, 2017) is only 25% defined (I will explain the details later) and VMT acknowledged it will take them a while to attract other tenants to fill the other 75% cargo capacity. Spending more time and money now will not answer this “75% undefined usage problem”, and this 25% partial description will not satisfy the CEQA completeness requirement. To be fair to everyone, and be CEQA compliant, we need a fully described operation (with 100% operation defined) with all impact considered as a whole. Some of the details here may have been known to you already but it is not common knowledge for many so I included them here for completeness. * First is the difference between a port and a water-related industry usage. * VMT’s original business plan is one Port + one water-related industry (Orcem) and they started the EIR process in 2012 based on this 1+1 configuration. * In a letter dated Nov. 2 2015, BCDC (San Francisco Bay Conservation and Development Commission) stated that a port use of the site is not consistent with the Bay Plan and will likely not be approved. BCDC Letter saying port use on this site is inconsistent with the Bay Plan. * This is the reason that VMT dropped the phase 2 project as pointed out in the public hearing part of the last Planning Commission meeting (Feb. 27, 2017). * In a letter dated March 25, 2016. BCDC noticed that Orcem will only be using 25% of the cargo capacity and questioned the usage of the other 75%. 25% used by Orcem. Who will be using the other 75% of capacity? 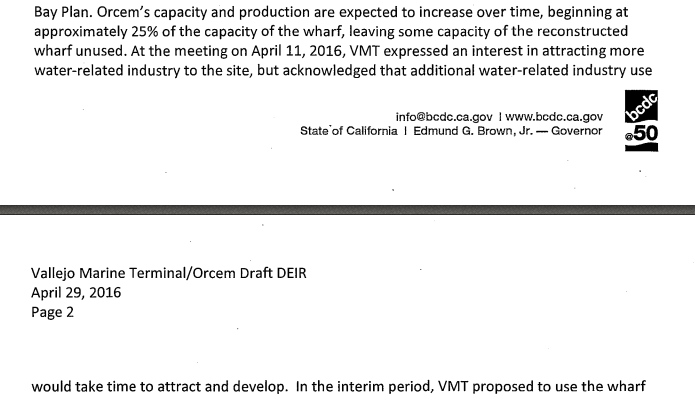 * This “port use is not consistent with the Bay Plan” and “Orcem is only using 25% of the cargo capacity” forced VMT to change their original business plan from 1+1 to 0 port + several water-related industries configuration (Orcem is just one of them). * This new business plan of 0 + Many is a major departure from the 1 + 1 configuration originally planned and submitted, and now 75% of the project is not defined under this new configuration. * In a meeting dated April 11, 2016, VMT acknowledged that it did not have any candidates in sight and it would take time to develop other water related industrial tenants for the other 75% cargo capacity. * Who will be using this 75% unused Cargo capacity? Nobody knows! It could be three other business similar to Orcem. Project permit application should be rejected by the City. Port use of the site is not consistent with the Bay Plan and it would take time for VMT to attract other water-related industrial tenants. As it stands now (March 6, 2017), the project is only 25% described (by Orcem operation) and the other 75% is undefined. It is not a matter of a month or two to attract other water-related industry tenants to have a complete description of the full operation of the site. Applicants need to submit a totally new DEIR that is consistent with their new and current plan. Thank you Chamber of Commerce for supporting the kinds of businesses that fit the goals and values of the people of Vallejo. And uphold the vision of the new General Plan. From the Times Herald: The Vallejo Chamber of Commerce continues to be full of surprises, months after endorsing progressive community advocate Liat Meitzenheimer for city council, the chamber has announced its opposition to the Vallejo Marine Terminal (VMT) and Orcem project. 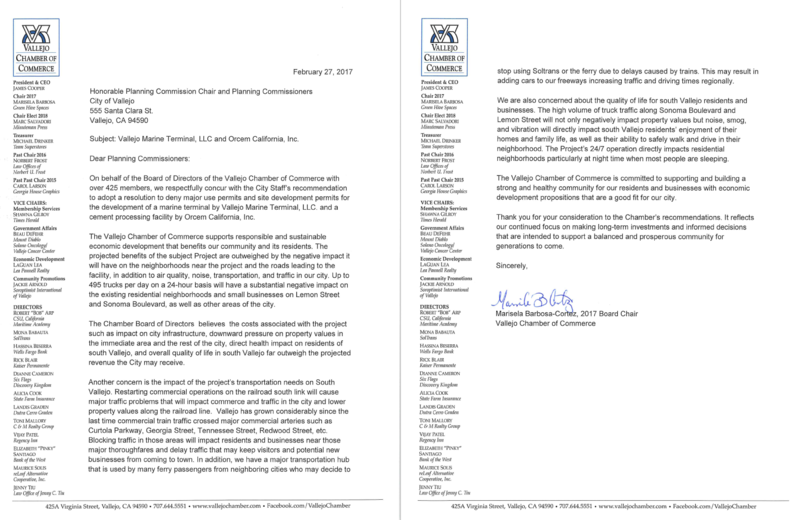 In a two-page letter released Monday night, chamber officials urged the city’s Planning Commission to reject the proposed south Vallejo project. 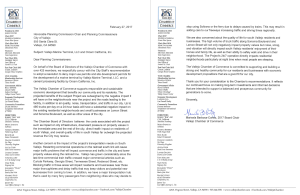 “The Chamber Board of Directors believe the costs associated with the project such as impact on city infrastructure, downward pressure on property values in the immediate area and the rest of the city, direct health impact on residents of south Vallejo, and overall quality of life in south Vallejo outweigh the projected revenue the city may receive,” chamber officials stated in the letter. Reporter John Ramos came to Vallejo on November 29, 2016 and spoke with residents of Vallejo opposed to the project. Thank you KPIX Channel 5! Click the link below to watch the video report. With all the waterfront acreage VMT is leasing from our city, how much do you think they have to pay? Currently (2016, June), VMT is paying $0, yes, zero, nada, zip per month to the City of Vallejo. And it’s been that for four years. Their current lease will allow them to pay as little as $1400/month if the project moves forward!! That’s about the rent for a small apartment in Vallejo? We started looking into this because this deal is too good to be true!! It’s the kind of sweetheart deal that all of us dream of. Some things refuse to die, and like zombies, through voodoo or witchcraft, keep coming back to life long after they should. Just like the old lease between General Mills, Inc. (GMI) and the City of Vallejo (COV), which somehow, out of the public view, keeps coming back to life over and over again. The Old Sperry Mill was last operated by GMI as a flour mill, sitting on property, some of which was owned by them, as well as land Held in Public Trust by the State and COV-owned land. Most of the historic Mill buildings stand on State land leased through the COV. A ground lease was executed between GMI and the COV acting as Trustee for the public land, on May 1, 1991, backdated to start January 1, 1989, to run for 25 years (until 2014), with an option to renew for another 25 years (to 2039). GMI ceased operations in 2001 and abandoned the site in 2004. They defaulted on the terms of their lease agreement, which should have terminated their lease according to California Civil Code. Three years later (February 27, 2007), a Memorandum concerning the GMI Lease was executed between GMI and the COV. 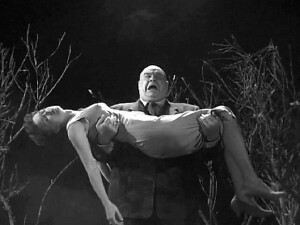 This was the first resurrection of our zombie lease. Two months later, the reasons became obvious. On May 30, 2007, the lease was assigned from General Mills to Cherokee Brooks Street Vallejo, LLC, a Delaware based company, with COV approval. The same exact day and time, Cherokee Brooks filed a Deed for the land GMI had owned. Cherokee purchased GMI’s land and took over its lease with visions of a restaurant, waterfront park and lots of homes. Another thing happened that May 30th, Cherokee Brooks assigned this deed and the Lease to Bank Midwest N.A. for a loan of $7,150,000, using their land and the lease with the COV as collateral for its huge development project. This could only have happened with the COV’s consent. If not entirely orthodox, everything seemed all right until the Recession hit. Cherokee Brooks apparently took the money, but defaulted on the loan before any construction or development had been done. Without providing required notice, the land and Lease were sold at a public auction: December 8 and 9, 2010 for $100,000. The high bidder for both of these was California Cherokee Brooks Return, LLC, a Missouri-based LLC. A month earlier—before the auction had actually happened—Bank Midwest had already assigned the Deed to this Cherokee Brooks, indicating that this company had been pre-selected to be the one and only bidder: a material violation of foreclosure laws. Two different LLCs, incorporated in different states, with different members, and strikingly similar names represented the old and new owners of the property and lease. By law, the foreclosure should have killed the lease too. But this is a zombie lease, and it had already emerged again. 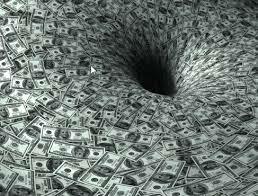 No one seems to know what actually happened to the $7 million. Mind you, VMT was agreeing to operate something similar to the old flour mill, not Cherokee Brooks’ big project. The COV filed its “Consent” for this. But oddly, the consent was for Cherokee Brooks Street Return Vallejo, LLC, a third “Cherokee Brooks” company, not otherwise involved: a probable mistake that nonetheless calls the lease assignment into question. At the same time, they issued a First Amendment, which started changing substantial terms. It changed from 25 years to 33 years, with an option to renew for another 33 years, showing the COV’s firm commitment to the extended lease. The Amendment contradicted the “categorical exemption” in the Lease and allowed “Other Alterations” including demolition, removal or replacement of any existing building on the leased land. While a categorical exemption is considered “No Project” under CEQA, the COV was agreeing to a “Project” involving demolition, which requires an Environmental Impact Report. That EIR wasn’t started until 3 years later. Who is Who on the Lease Signing. This Amendment also allowed for “abatement of rent” through June 2015 and a “Capital Improvement Offset” against 85% of the base annual rent of $95,520. The offset is for a maximum of $8 million over the term of the lease, meaning most of the rent could be offset for more than 98 years—longer than the lease—and their rent could be as little as $14,328 a year (a little less than $1,200 a month). The Amendment also allowed VMT to sublease the property for up to 10 years. As Trustee for this Public land, the COV is legally required to work for the best possible deal in the Public’s interest, not the best possible deal for the folks leasing the land. On Sept. 5, 2013, a year after getting the Lease and First Amendment, VMT and the ORCEM cement company jointly applied for a building permit: the first time ORCEM’s name appears publicly. 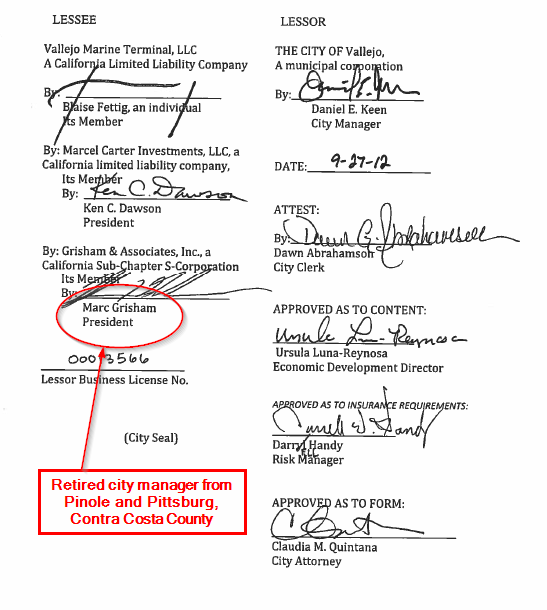 Other documents reveal that VMT already had an agreement for ORCEM to sublease the property. On June 9, 2014 a Second Amendment was signed as a “minor administrative amendment,” not requiring City Council approval. It allowed VMT to subdivide the land and sublease the subdivided land. Subdivision hadn’t been allowed by the First Amendment, but a sublease for up to 10 years was allowed without COV approval. The Amendment indicates the subdivision was exempt from the Subdivision Map Act, citing parts of CA Government Code that deals with subdivision for right-of-way, not leases: an infraction that carries criminal and civil penalties. ORCEM was publicly acknowledged as a sub-Lessee by a Memorandum on March 10, 2015, stating that its sub-lease with VMT was executed May 23, 2013, almost 2 years earlier, and just eight months after the “zombie lease” was assigned and the First Amendment executed. The Sub-lease is private and its terms haven’t been revealed yet. But we assume that the COV is not getting paid from that transaction: those arrangements are between ORCEM and VMT. We question whether the sub-lease is legal, because the agreement doesn’t include any consideration for the use of Public Land. We also find it hard to believe that ORCEM really agreed to a lease of just 10 years, the maximum term allowed by the First Amendment without COV approval. $0 rent/month for 4 years! My Dream Lease! 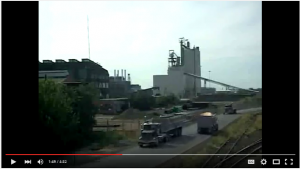 On Sept. 3, 2015, a Draft Environmental Impact Report (DEIR) was released for public comment. The DEIR was still in public review. No mitigation measures had been identified, nor were any significant environmental impacts that might be mitigated or avoided. Yet they were agreeing to them all in advance. The COV, for all intents and purposes, gave impermissible approval to a “Project involving demolition” and gave VMT entitlements not commonly seen in ground leases. The three amendments show for all intents and purposes a partnership between the COV and VMT/Orcem. If that were intentional, it would be governed by a whole slew of other regulations that weren’t followed. The old zombie GMI lease has long overstayed its welcome and needs to be buried. Its current, thrice amended form cannot withstand scrutiny or be defended. There seem to be many indications of concession, collusion and cover-up. The City of Vallejo needs to come clean now and cancel this lease. It needs to stop abating non-existent rent. 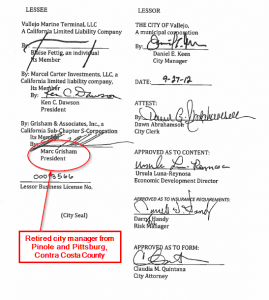 Four years of no rent and numerous CEQA violations have not served the Public Trust and are sufficient grounds to cancel the lease, or the COV risks another lawsuit to overturn it. Let this die once and for all. 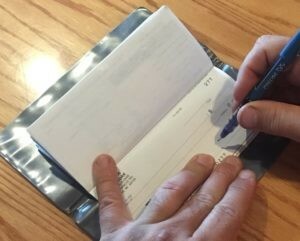 This manner of doing business in Vallejo has to stop.